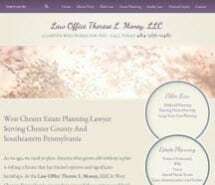 At the Law Office Therese L. Money, LLC, in West Chester, we represent clients throughout Southeastern Pennsylvania in a variety of legal issues, including estate planning, personal injury and family law matters. We understand that people come to us during times when they are facing an uncertain future. It is our goal to help them find clarity in these complex and sometimes intimidating situations. We will be there beside you at every step, maintaining a constant focus on a solution that protects your interests, both now and in the future. Our law firm's founding attorney, Therese L. "Terry" Money, Esq., is passionate about elder law and helping her clients with Medicaid planning, long-term care planning and other important issues. She was her parents' primary caregiver at the end of their lives, and she has a deep appreciation for the value of early and thorough preparation in these matters. Terry brings the same passion she has for elder law to her estate planning, personal injury and family law practices. With the support of a dedicated professional staff, Terry is tireless in her pursuit of a just and fair resolution for every client. Contact the Law Office Therese L. Money, LLC, to discuss your legal needs with a dedicated lawyer who cares as much about the outcome of your legal matter as you do.